Step out of your front door, look to your side - and there it is.. The beach, just a few steps away!! Situated on the Glenelg North Esplanade, this recently refurbished cottage is perfect for short or long term holidays. If you encounter trouble booking this property, please see our other properties, "Sleep By The Sea" and "Sea At Your Doorstep", whic hare in the same location and offer similar benefits and attributes. An outdoor bbq will be available In your front patio area, together with outdoor chairs and a small picnic table. The cottage was fitted with brand new furniture and bedding in July 2016. It combines a clean, crisp, modern feel with the cosiness of an old cottage. The place has been fitted so that you can have a comfortable short or long term stay. It offers a fully equipped kitchen, your own laundry facilities, TV and DVD entertainment, linen and towelling – just pack your toothbrush and bathers!!. 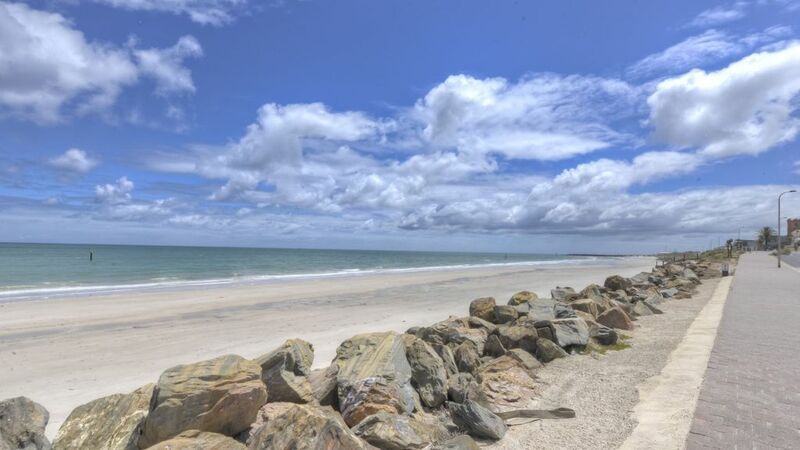 This property is on the Esplanade, with Sea By Your Side located approx 20m from the start of the esplanade, such that you have a direct view of the beach from your front patio and lounge window. A communal back yard. Communal area, with clotheslines (which are scheduled for replacement soon). My partner and I haven't had a holiday in a long time, so we thought we'd go somewhere neither of us had been. Glenelg is a fantastic beach and our accomodation was absolutely wonderful. So relaxing and comfortable. All the correspondence I had with Sofie was always warm and friendly and we both felt so welcome in both the unit and Glenelg too. Very welcoming and comfortable place to stay. Lots of lovely little extras . thoroughly enjoyed the stay and will definitely recommend to friends and family. Was a little disappointed when I first arrived as I assumed I had sea views. Once inside I immediately felt at home. The unit is spotless, all the extra little touches bought a smile to my face. A hand written welcome was lovely and then a text to make sure I had arrived safely. In a great location and have enjoyed my time here. Would recommend and would book again. Thankyou. Fantastic, modern clean and with so many extras! Relax, beach it family stylz! Perfect family holiday home. Across the road to beach, evening walks to marina or shops for coffee. Play on ferris wheel or in variety of games areas. Tram into city...or drive 15 min to aquatic centre. Endless things to do. The unit has everything you would need, it's been well thought out! Highly recommend!